A 17 judge bench of the Supreme Court of Pakistan (SC) on Wednesday by majority of 11 against 6 upheld the 21st amendment to the Constitution of Pakistan providing for the establishment of military courts in Pakistan. The Court by a comprehensive majority of 14 against 3 also dismissed petitions challenging the 18th amendment to the Constitution. The 17-judge bench was presided over by the Chief Justice of Pakistan Nasirul Mulk. Pakistan’s Parliament had passed the 21st Amendment extending the jurisdiction of the Military Courts to try certain class of civilians after Taliban gunmen massacred 134 children at the Army Public School in Peshawar, last year. Parliament’s move to create special courts had sparked concern amongst human rights activists and in April a group of lawyers had approached Pakistan’s Supreme Court challenging the said 21st constitutional amendment. The 18th Amendment to the Constitution provided for the establishment of a judicial commission and prescribed a new procedure for the appointment of judges of superior courts. 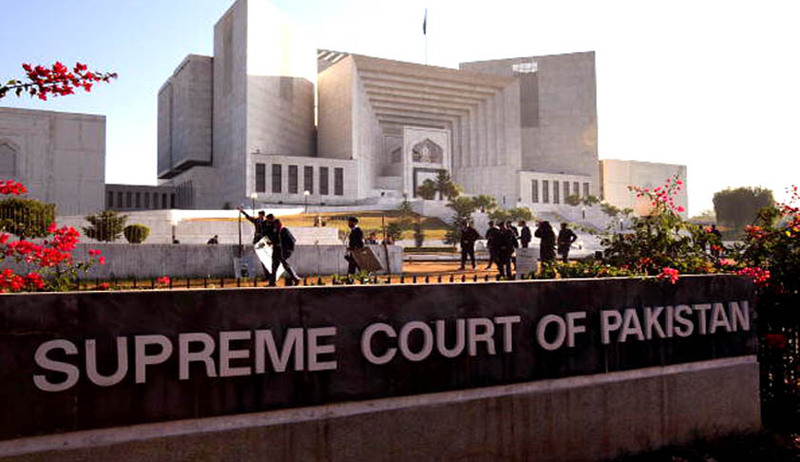 However the Supreme Court vide an interim order reported as Nadeem Ahmed, Advocate v Federation of Pakistan (PLD 2010 SC 1165) referred the matter of appointment of judges back to Parliament for re-examination along with its proposals to enable it to re-examine it in terms of the suggestions made by the SC. Later the Parliament brought the 19th Amendment by accepting almost all the proposals and incorporating in the Constitution as suggested by the Supreme Court. Altogether a total of 31 constitutional petitions were taken up by the court, of which 16 petitions were regarding 18th Amendment, while the rest pertained to the 21st amendment. The petitions challenging the 18th and 21st Amendments to the Constitution were clubbed and heard together as the two sets of cases involved a common constitutional question as to whether there are any limitations on the powers of the Parliament to amend the Constitution and whether the Courts possess jurisdiction to strike down a constitutional amendment? The focus of this report will be essentially on the arguments canvassed on the basic structure doctrine (with reference to Indian case laws) and how the Court dealt with the same in its judgment. The petitioners’ contention principally was that there are certain basic features of the Constitution which are unamendable and that notwithstanding ostensible conferment of unlimited power on the Parliament by clause (6) of Article 239 and ouster of jurisdiction of the Courts by clause (5) thereof, the Parliament is not empowered to bring about changes in the basic structure of the Constitution. Mr. Hamid Khan Sr. ASC appearing on behalf of the Lahore High Court Bar Association (LHCBA) and the Lahore Bar Association made a comparison of the said Amendment in Article 239 with the amendments made through the 42nd Amendment in Article 368 of the Indian Constitution and contended that the purpose of the amendment was the same i.e. to oust the powers of the Supreme Court to call into question any amendments made in the Constitution; that the said 42nd Amendment of the Constitution of India was introduced to nullify the effects of annulment of constitutional amendments on the ground of them being violative of the basic structure in the cases of Kesavananda Bharati v. State of Kerala (AIR 1973 SC 1641) and Indira Nehru Gandhi v. Shri Raj Narain (AIR 1975 SC 2299). Among other decisions, the judgments rendered the Supreme Court of India in the cases of Advocates-On Record Association v. Union of India (AIR 1994 SC 268) and In Re: Presidential Reference (AIR 1999 SC 1) were relied on by Mr. Hamid Khan to contend that the judiciary had declared and affirmed the independence of Judiciary from Executive as necessary to ensure that the tendency of other organs of the state to overstep their Constitutional limitations remain under check. Relying upon the basic structure theory, as developed and expounded upon by the Indian Supreme Court, learned Counsel argued that there is a basic structure to the Constitution of Pakistan as well, which has been affirmed by the Superior Judiciary of Pakistan in various cases. That the idea of basic structure prevents the power to amend from turning into power to destroy the Constitution. He submitted that the Doctrine of basic structure was an academic thesis introduced by Professor Dietrich Conrad, a German professor of Law, which was adopted by the Indian Supreme Court in Kesavananda Bharati (supra) and affirmed in later judgments. Further by relying on comparative Constitutional analysis of Germany, Turkey, Austria, Romania and some other jurisdictions, Mr.Hamid Khan contended that power to amend the Constitution is limited across the globe. Applying the ‘Basic Structure Doctrine‘ to the Constitution of Pakistan he argued that the first instance of basic structure in Pakistan can be found in the case of Mr. Fazlul Quader Chowdhry and others v. Mr. Muhammad Abdul Haque (PLD 1963 SC 486); that the said judgment was also quoted by the Indian Supreme Court in the case of Sajjan Singh v. The State of Rajasthan (supra) acknowledging the fundamental features of the Constitution. Mr. Iftikhar Gillani, Sr. ASC, representing the Government of Khyber Pakhtunkhwa advanced the proposition of law that the Parliament‘s power of amendment of the Constitution was in the nature of ―Constituent Power‖, on which no limitations whatsoever could be placed; that had the framers of the Constitution intended it to be so, they would have placed such limitations themselves upon the powers of the parliament. In this context he also argued that when an Act of the Parliament amending the Constitution is passed, the Act becomes part of the Constitution; that all provisions of the Constitution are of equal importance and that Fundamental Rights have not been given any primacy over other provisions of the Constitution. While countering the contention that Parliament if left unchecked could go to any extreme in amending the Constitution, he argued that as the parliamentarians and political parties have to return to the people for seeking vote they will remain on guard not to make unpopular amendments. He further argued that there are about 32 Constitutions of the world where basic structure has been defined and laid down with precision and out of those 32 Constitutions only 6 have provisions limiting the power of parliament to amend the Constitution before the judgment in Kesavanda Bharati (supra); that limitations in rest of the Constitutions were introduced after the said judgment. It was also contended by him that Parliament has both constituent and legislative powers; that the validity of a constitutional amendment cannot be made on the touchstone of fundamental rights; that constitutional amendment is not law within the meaning of Article 8 of the Constitution. Mr. Khalid Anwar, Sr. ASC, representing the Federation of Pakistan presented arguments on both the 18th and 21st constitutional amendments mainly on the basic structure doctrine. He began by dividing basic structure doctrine into two mutually exclusive and distinctive parts: a) Basic Structure as a descriptive doctrine: It identifies provisions considered to be primary to the basic structure of the Constitution; b) Basic Structure as a prescriptive doctrine: It grants power to the Judiciary to strike down constitutional amendments which modify basic features of the Constitution. Basic structure as a prescriptive doctrine creates unamendable parts of the Constitution, which are to be protected from amendment by the Courts. 26. He argued that the basic structure prescriptive doctrine is at best an academic exercise; that theories cannot be equated with law as law has two distinct features i.e. clarity and its presence in the public domain as public knowledge; that basic structure of the Constitution has neither been clearly laid down by the Courts nor is it clearly present in the public domain. Dilating upon the case law from the Indian jurisdiction on the application of the basic structure doctrine to constitutional amendments, Mr. Khalid Anwar submitted that the case of Kesavananda Bharati (supra) introduced a new type of judicial power, whereby the Courts of India have assumed jurisdiction over constitution amending power of the Parliament. That this jurisdiction, as assumed in the said Indian case, does not exist in Constitution of India or of Pakistan and it is an instance of self conferred power by the judiciary. This self-conferred power in operation and theory destroys the separation of powers as has been ordained in the Constitution. He contended that the search for basic structure by the Courts is basically an exercise in metaphysics whereby determination of the essence of the Constitution is attempted; that it is an indeterminate process and in this regard he referred to paragraph 668 of Indira Nehru Gandhi (supra) wherein the Court noted that ―…The theory of Basic Structure has to be considered in each individual case, not in the abstract, but in the context of the concrete problem…‖ That even Indian judiciary could not identify basic structure of the Indian Constitution with clarity and it could only identify various aspects forming basic structure of the Indian Constitution in various succeeding judgments. In the light of various judgments by Indian Supreme Court learned Counsel formulated that the basic structure of any Constitution is neither fixed nor permanent and cannot be discerned with clarity or fully discovered; that in order to keep the Constitution relevant to the changing times and as a living document it ought to be allowed to change; that there is always an element of subjectivity involved in determining basic structure of any Constitution which differs when different readings are put on it by different judges; that society and institutions develop over time and constitution require changes to keep up with the changing social and economic conditions. Any attempt to take the Constitution back to its basic structure would be highly retrogressive as it would put appointment of judges back into the hands of the Executive, it was contended. Mr. Khalid Anwar submitted that Courts do not have the jurisdiction to subject Amendments to the Constitution to Judicial Review. Mr. Abid S. Zuberi, ASC appearing for Sindh High Court Bar Association, Karachi through its Secretary argued that the military courts are against the basic structure or salient features of the Constitution and should hence be struck down. It was contended, the extension of the powers of military courts over the civilians abridges the fundamental right of access to justice; that independent court, independent procedure and right to engage counsel of choice are the essential elements of a fair judicial system, which are denied to those to be tried by the military courts. Ms. Asma Jahangir, ASC representing Supreme Court Bar Association (SCBA) through Secretary submitted that the SCBA does not support the basic structure theory as a ground to strike down constitutional amendment. Chief justice Nasirul Mulk and Justice Iqbal Hameedur Rahman’s opinion observed that the fundamental issue in all these matters is the power of the Court to strike down a constitutional amendment and the grounds or the basis for the exercise of such power. “This question has remained the subject matter of cases before our Courts as well as in India and amendments to the Constitution have been challenged on the touchstone of the basic structure theory” the court said. Chief justice and Justice Iqbal Hameedur Rahman’s opinion refers to the decision in Zia-ur-Rehman case [(PLD 1973 SC 49)] which was the case in which the Pakistan Supreme Court for the first time considered the power of the Courts to strike down a Constitutional Amendment. The petitioners therein had challenged the validity of the Interim Constitution of 1972 and the competence of the National Assembly to frame such a Constitution. Chief justice Nasirul Mulk and Justice Iqbal Hameedur Rahman observed that in Zia-ur-Rehman it was however laid down that the judicial review over Constitutional Amendments was only limited to considering if the proper procedure for introducing such amendment was followed and did not extend over the substantive parts of the amendment. Chief justice Nasirul Mulk and Justice Iqbal Hameedur Rahman’s opinion referred to the fact that in Abdul Wali Khan ((PLD 1976 SC 57) the Pakistan Supreme Court did not follow the arguments based upon the Indian judgments of Golak Nath (supra) and Kesavananda Bharati (supra) but followed and affirmed the principle in Zia-ur-Rahman‘s case that the validity of a Constitutional amendment can only be challenged if it is adopted in a manner different to the prescribed by the Constitution or is passed by a lesser number of votes than those specified in the Constitution. After thus surveying the authorities holding the field, Chief justice Nasirul Mulk and Justice Iqbal Hameedur Rahman’s opinion observed that “The above discussion leave one in no doubt that this Court has right from the 1973 case of Zia-ur-Rahman to Wukla Muhaz and Pakistan Lawyers Forum (supra) consistently held that the basic structure theory has been recognized only to the extent of identifying salient or fundamental features of our Constitution. However, the theory has never been accepted or applied as a ground for striking down amendment in the Constitution. The Court has consistently refused to follow the position taken by the Supreme Court of India on the subject. Chief justice Nasirul Mulk and Justice Iqbal Hameedur Rahman then proceeded to make a critical analysis of the history of the struggle and conflict between the judiciary and parliament in India necessitating the development of the basic structure doctrine, and said that the basic structure theory, developed by Professor Conrad, in the wake of the harrowing experience of the Nazi Germany, was adopted by the Courts of India as a tool to create jurisprudence for ensuring their supremacy over the Parliament. The struggle for supremacy between the judiciary and the parliament over interpretative finality over the Constitution has been sketched out in detail in the judgment of the Supreme Court which repays study. Chief justice Nasirul Mulk and Justice Iqbal Hameedur Rahman’s opinion refers to the fact that the theory of implied limitations on the powers of amendment by the Parliament was accepted in the case of Kesavananda Bharati when amendments to the Constitution weakening the right to property were challenged before the Court. The later judgment in Indira Gandhi was pronounced during a period of emergency, when Constitutional amendment had been passed to help the then incumbent Prime Minister in her appeal, pending before the Supreme Court. Chief justice Nasirul Mulk and Justice Iqbal Hameedur Rahman’s opinion said “These judgments have been criticized for introducing uncertainties as the Parliament while amending the Constitution would not know as to whether the amendment would survive the test of basic features forming the basic structure of the Constitution. Kesavananda Bharati did not lay down with precision any of the basic features of the Constitution which were identified by the Court in the later cases of Indira Gandhi, Minerva Mills Ltd., Waman Rao, I.R. Coelho (supra) etc and have been listed by certain commentators on Indian Constitution to be 27 in number and growing in count. Even these identified basic features are very broad in nature and open to varied interpretation by the judiciary. The dissent in Kesavananda Bharati questions many of the assumptions forming the basis of laying down implied limitations on Parliament‘s powers to amend. One of the arguments forwarded was the ‗fear‘ theory, expressing distrust in the Parliament‘s unbridled powers of amendment, as it was contended that it may lead to complete abrogation or even repeal of the Constitution by it. This ‗fear‘ theory is based upon the appalling and sad history of the amendments introduced by the Nazi dictatorship of the Third Reich to the Constitution of the German Reich (Weimar Constitution) of 1919 through the Enabling Act of 1933 (Reference can be made to the following text for a theoretical account of the constitutional and legal history of Germany under the Nazi totalitarianship: ―State of Exception‖ by Giorgio Agamben). Chief justice Nasirul Mulk and Justice Iqbal Hameedur Rahman’s opinion pointed out that the position in India also differed from Pakistan as there was no jurisdiction ousting clause in the Constitution of India restricting the powers of the Parliament to amend the Constitution under Article 368 before the judgment in Kesavananda Bharati. It was only later, that to grant protection to constitutional amendments, that clause (4) was added to Article 368 through the Forty Second Constitutional Amendment, to oust the jurisdiction of the Courts from calling into question any amendment to the Constitution. The said clause was later held to be unconstitutional and void in Minerva Mills Ltd. whereas similar provisions in the Constitution of Pakistan i.e. clauses (5) and (6) of Article 239, introduced through the Eighth Amendment, remained unchallenged. Rather, the said Amendment as a whole has been held to be valid in the case of Mahmood Khan Achakzai. Chief justice Nasirul Mulk and Justice Iqbal Hameedur Rahman said that the basic structure theory does not have any universal acceptance in comparative constitutional analysis and also has limitations as highlighted in dissenting notes of Kesavnanda Bharati. Ideas cannot be uncritically borrowed from foreign jurisdiction, without understanding the particular histories of their development or appreciating their consequences in the host jurisdiction, especially when our own jurisprudence on the said question has already been settled and for good reasons. Accordingly Chief justice Nasirul Mulk and Justice Iqbal Hameedur Rahman ruled that there are no limitations, express or implied on the powers of the Parliament to amend the Constitution and the amendments brought about in exercise of such power are not liable to be challenged on any ground whatsoever before any Court. However 8 judges of the Pak SC, namely Justices Anwar Zaheer Jamali, Sarmad Jalal Osmany, Amir Hani Muslim, Gulzar Ahmed, Sh. Azmat Saeed, Mushir Alam, Umar Ata Bandial and Maqbool Baqar delivered a common judgment holding that the Constitution contains a scheme reflecting its Salient Features which define the Constitution. Such Salient Features are obvious and self evident upon a harmonious and wholistic interpretation of the Constitution. In an effort to discover such Salient Features material outside the Constitution cannot be safely relied upon. The Salient Features as are ascertainable from the Constitution including Democracy, Parliamentary Form of Government and Independence of the Judiciary. The 8 judges said that the Court is vested with the jurisdiction to interpret the Constitution in order to ascertain and identify its defining Salient Features. It is equally vested with jurisdiction to examine the vires of any Constitutional Amendment so as to determine whether any of the Salient Features of the Constitution has been repealed, abrogated or substantively altered as a consequence thereof. However they held that the provisions of the 21st Constitutional Amendment as such are intra vires the Constitution as the enlargement of the jurisdiction of such forum is subject to due compliance with an ascertainable criteria constituting a valid classification having nexus with the defence of Pakistan and does not abrogate, repeal, or substantively alter the Salient Features of the Constitution. Justice Jawwad S. Khawaja also said that it is essential to strike down the 21st amendment as Parliament is not sovereign as its power to amend the Constitution is constrained by limitations which are clear from the reading of the Constitution as a whole. Secondly, these limitations are not only political but are subject to judicial review and, as a consequence, this Court has the power to strike down a Constitutional amendment which transgresses these limits. A law or amendment which contradicts the principles of democracy or conflicts with the independence of the judiciary cannot be part of the powers of elected representatives, read the dissenting note. Justice Qazi Faez Isa agreed with Justice Jawwad Khawaja saying that he was complete agreement with his opinion. In view of the respective opinions recorded above, the Supreme Court of Pakistan by a majority of 13 to 04 held the Constitution Petitions to be maintainable. However, by a majority of 14 to 03 the Constitution Petitions challenging the Constitution (Eighteenth Amendment) Act (Act X of 2010) were dismissed, while by a majority of 11 to 06 the Constitution Petitions challenging the Constitution (Twenty-first Amendment) Act (Act I of 2015) and the Pakistan Army (Amendment) Act (Act II of 2015) were dismissed.